A Lawrence Police Department crime scene team investigates Saturday, Jan. 5, 2019, at the Carnegie Building, 200 W. Ninth St. In addition to a man being shot inside the Carnegie Building last weekend, someone fired shots into an occupied vehicle nearby in relation to the same incident, police say. 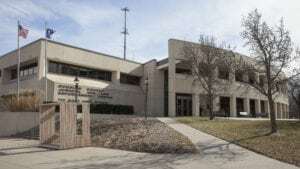 The shooting happened shortly after 12:30 a.m. Saturday, Jan. 5, inside the historic city facility at 200 W. Ninth St. in downtown Lawrence. A 19-year-old Topeka man showed up at the hospital with a single gunshot wound, which police believe was from shots being fired in the Carnegie Building. His injuries were not life-threatening. In addition, shots were reportedly fired into an occupied vehicle “in the downtown area” in the early morning hours of Jan. 5, Sgt. Amy Rhoads said this week. No one was injured in that shooting, she said. “We believe the second incident involved individuals in attendance at the Carnegie Building,” Rhoads said in an email. 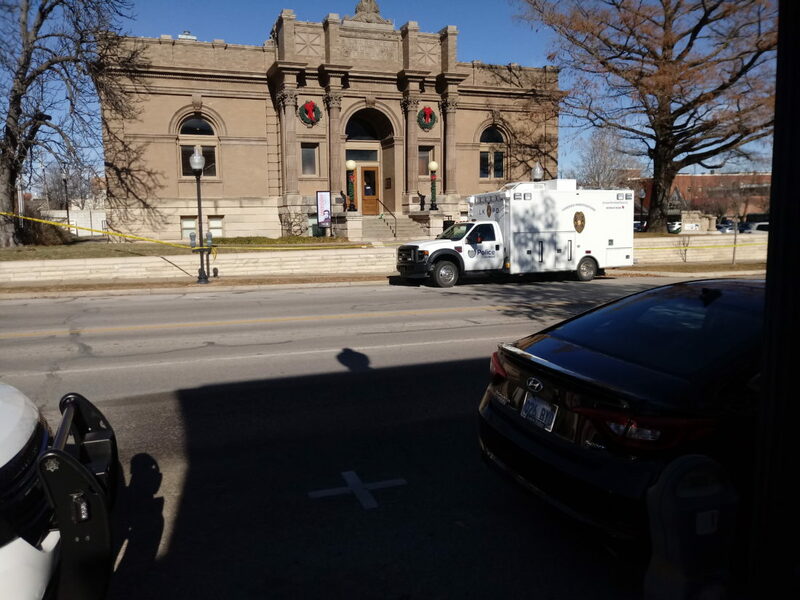 She said the shooting into the vehicle was reported to police while they were on scene investigating the shooting at the Carnegie Building the morning of Jan. 5. 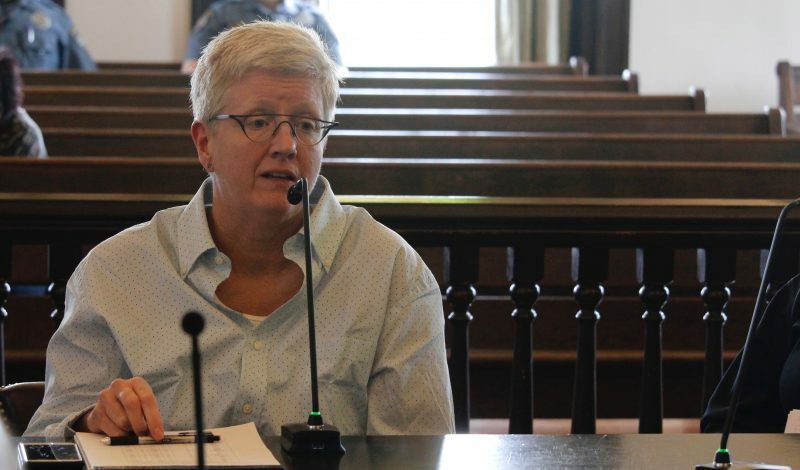 It was assigned a separate incident number a few days later, earlier this week, “due to the complexity and amount of people that were interviewed during the investigation,” Rhoads said. The Lawrence Parks and Recreation Department operates the facility and rents it out for private events. The Carnegie Building’s Heritage Room was rented to an individual for a private event between 10 p.m. and 1 a.m. that night, according to Porter Arneill, the city’s director of communications and creative resources. Arneill said alcohol sales and use are allowed at the Carnegie Building and that alcohol was being served at that event. Shortly after 12:30 a.m. Jan. 5, a Lawrence police officer in the 800 block of Vermont Street saw a group of people running through a nearby parking lot, then heard what sounded like a single gunshot coming from inside the Carnegie Building, according to the police department’s previous news release. Several more people were then seen running from the area. Police secured the building but found no one injured until making contact with the man being examined at the hospital. No arrests had been made as of Friday, and the police investigation was ongoing. The Lawrence Police Department asks anyone with information about the incidents to call them at 785-832-7509, or to remain anonymous, call Crime Stoppers of Lawrence and Douglas County at 785-843-TIPS (8477).